Rajinikanth’s first look as a cop from Darbar is out! Rajinikanth is all set to play the character of a cop in his upcoming film, Darbar. On Tuesday (April 8) morning, the makers, Lyca Productions, took to their Twitter account to share Thailavar’s cop-look. Darbar marks the 167th film in Rajinikanth’s career. 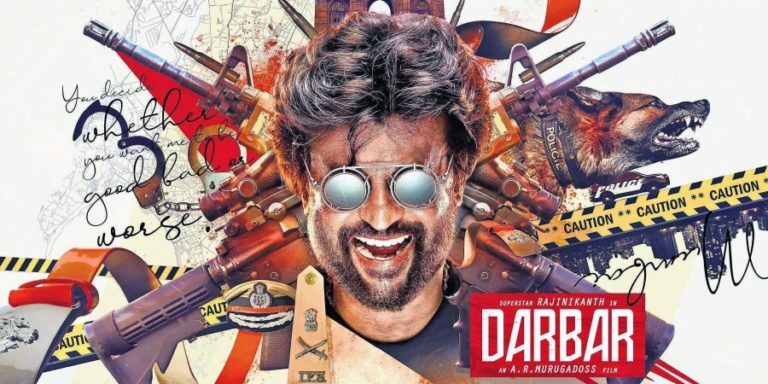 Darbar marks Rajinikanth’s first collaboration with ace filmmaker AR Murugadoss, which is produced by Lyca Productions. The film also sees Nayanthara in an important role. Talking about the poster, Rajinikanth in is typical style looks all pleased as he is surrounded by guns, dog, barricades, Gateway of India, which gives us a hint that the story unfolds in Mumbai. Rajinikanth’s last stint as a police officer was in the film, Pandian, which came in 1992. Apart from this, he also essayed the character of cop Alex Pandian, from Moondru Mugam (1982) also left a powerful impact on the audience. Talking about Nayanthara, after working with Rajinikanth in Chandramukhi and also briefly in Kuselan, this is the third time Nayanthara will be teaming up with the 68-year-old star. Nayanthara was last seen playing a hostel warden with a violent past in Petta. Popular lensman Santosh Sivan will crank the camera while Anirudh Ravichander will compose the music. The rest of the cast and crew is yet to be revealed. The industry grapevine is that the project goes on the flNayanthara cast with Rajinikanth in Murugadoss’ floors later in Mumbai.